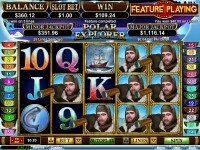 Polar Explorer is a new addition to the many slots that are offered in an RTG online casino. This new slot has 25 paylines, wild symbols, three different bonus features, a progressive jackpot, plus the Feature Guarantee. In addition to the opportunity to win a progressive jackpot, the game offers a top fixed jackpot that can be worth as much as $25000. 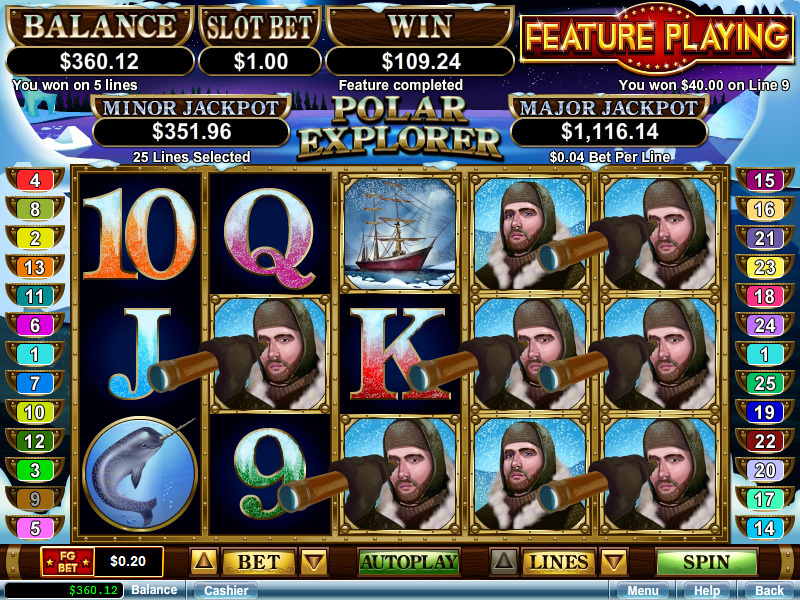 Full of great features, Polar Explorer is a great choice when you are looking to play slots from a reliable software provider. This game is an affordable option no matter what your casino budget is. You can choose to play this as a penny machine or the line bets can be increased to $5. The maximum bet $125 per spin, and if you reduce the number of paylines in play, the minimum bet is one cent. 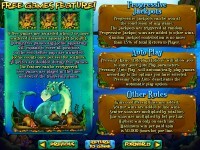 This game offers a feature that is not available on many slot games. You will be betting an additional 20% for the Feature Guarantee, and you will be guaranteed to activate a bonus round within 125 spins or less. If you don’t trigger the feature in 125 spins, you will be taken directly to one of the features. The other way to trigger the bonus round in the game is to get the snowflake image on the middle three reels. This will bring you one of three features. 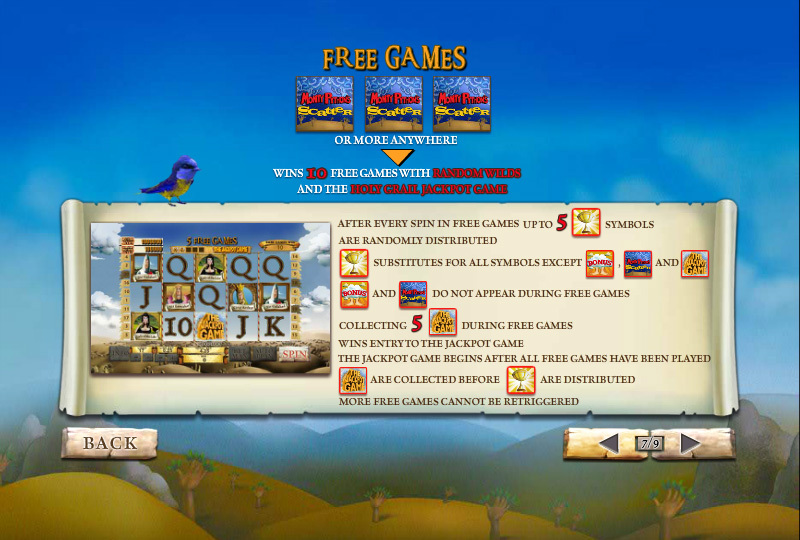 The Explorer Feature will earn you five free games and the last two reels on the screen will be completely wild. Getting three scatters during the free spins will add an additional 5 free spins. Another bonus round is the Discovery Feature. This bonus round will offer 8 free games and at least one reel during all free spins will have at least one wild symbol. 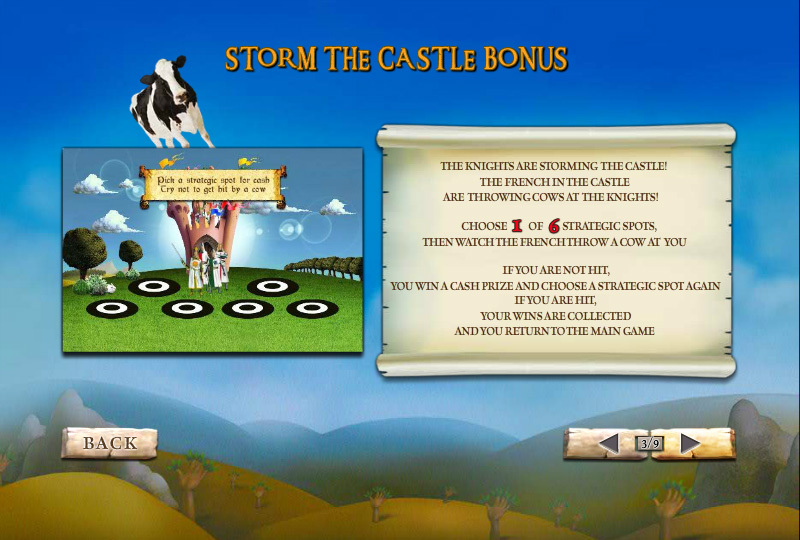 If three scatters land during these free spins, you will be awarded an extra 8 free spins. The last bonus round is the Hidden Treasure Feature. This bonus starts off with a screen showing 5 treasure chests in a cave. You select these chests, collecting up to three bonus symbols, until a cave-in occurs. Those bonus symbols will become wild during free spins, and if you hit three scatters, you will get an extra 5 free spins. This slot game is full of features, but you will also be impressed with the regular payouts that are offered. Using the standard symbols in the game, it is possible to hit a nice win without triggering a bonus round in the game. Polar explorer is a good slot for players of all skill levels and since there is also a progressive jackpot to be won, you will be eager to get these reels spinning. 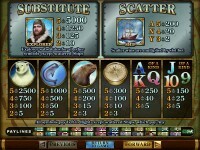 The game is available at RTG online casinos only. 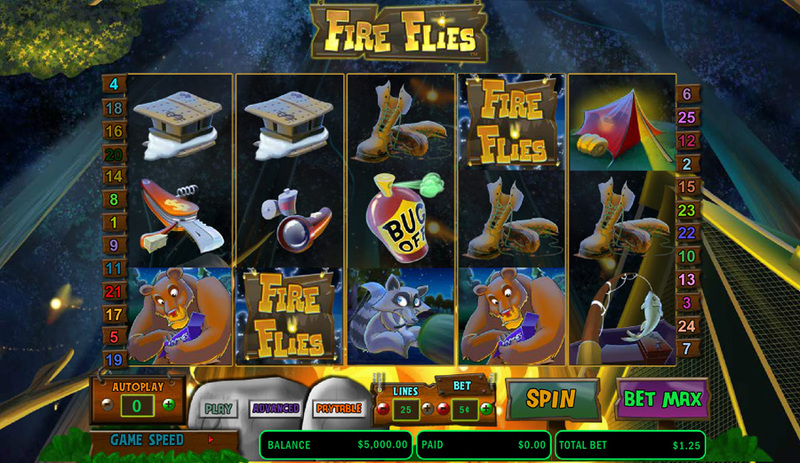 Fire Flies is a new slot machine developed by Cryptologic, for play in online casinos such as Intercasino. 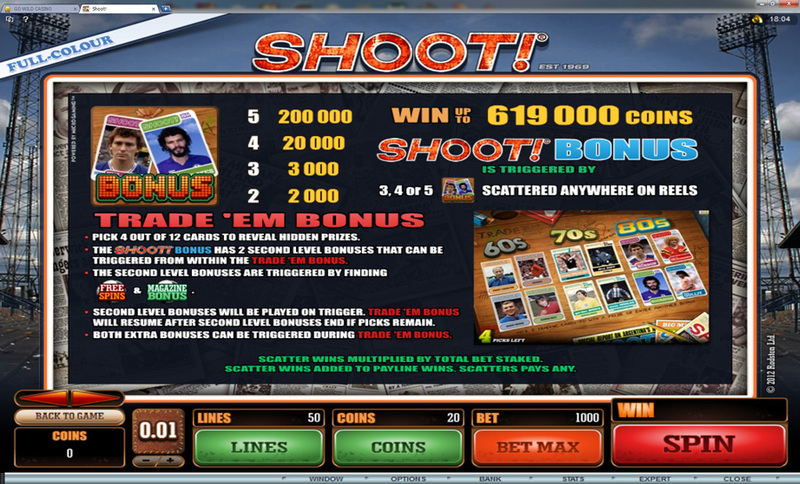 This video slot game is a five reel slot that offers 25 paylines, random wilds, and free spins with random wild reels. The maximum payout on the game is worth $50,000 so there are opportunities to walk away from the game with a hefty amount in the bankroll. Like most Cryptologic slots, Fire Flies is a great choice if you want to play an exciting video slot on any kind of budget. Since this game supports different coin denominations, and your choice of the number of paylines to play, you will be in control if your budget while playing. For as little as $0.01 per payline, you can enjoy all the action in the game. This bet amount can be increased to as much as $10 per line, making the maximum bet worth $250 for a single spin. The wild symbol is not found on the reel strips, it is placed on the reels randomly after each spin instead. A spark will drop in and light one or more of the symbols on fire, making them wild. It seems like it is usually the highest paying symbols that turn wild. The scatter symbol in the game is the camp fire and this can appear in any position on the reels. If you can get one of these symbols on both the first and fifth reels, you will trigger the free spins feature in which you will receive 7 free spins. You are also awarded 2x your total bet for triggering the feature. During the free spin round, the wild symbol is still random, but it makes entire reels wild instead of just one symbol at a time. 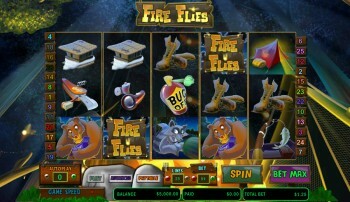 Fire Flies is an exceptional game that can be enjoyed no matter what your casino budget allows. This game is well designed and will surely provide you with many hours of entertainment and high payouts. This is another hit slot from Cryptologic, you can find Fire Flies at these Cryptologic Casinos. Cryptologic is a great software provider that has been creating slot games for many years. 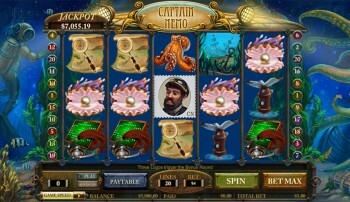 Captain Nemo is one of the newer online slot games from this company that you can enjoy when playing at Intercasino. 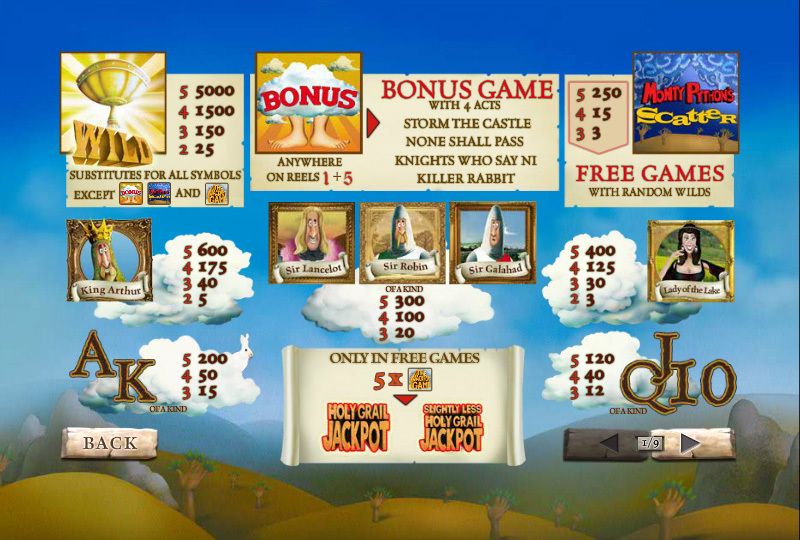 This is a video slot that features 20 paylines, wild symbols, a bonus feature, and a progressive jackpot. This game is a great choice when you are playing on a budget, or if you are high rolling. As an adjustable slot, you will be able to choose from different betting options to suit your budget. The coin denominations on this game range from $0.01 to $20, making the maximum bet per spin worth $400. You can also adjust the number of lines played from 1 to 20, making the minimum bet worth 1 cent. The game features a wild symbol that can appear in any position on the reels. This symbol is the sunken ship and it will substitute for all other symbols in the game. The wild will not take the place of the scatter icon, but it will help you to complete additional winning combinations. Each time the wild is used in a combination, it will become animated, adding to the visual appeal of the game. 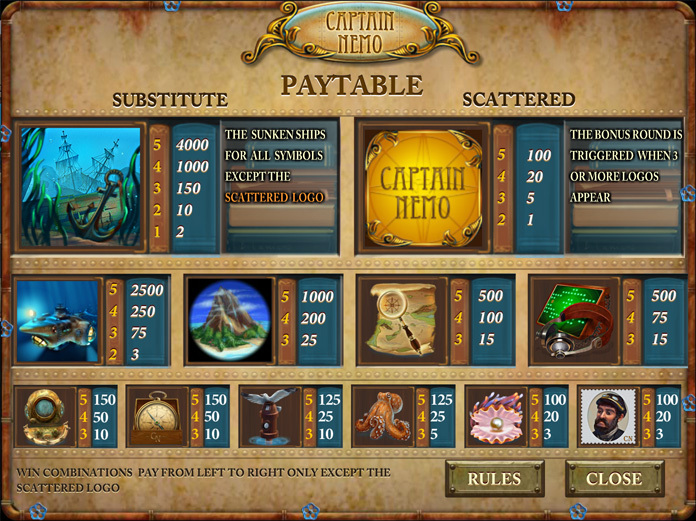 The Captain Nemo logo is the scatter symbol and two or more of these will result in a scatter win. If three or more appear anywhere on the reels, you will trigger a bonus round. In this round, you will go to a second screen bonus that takes place in the control room. 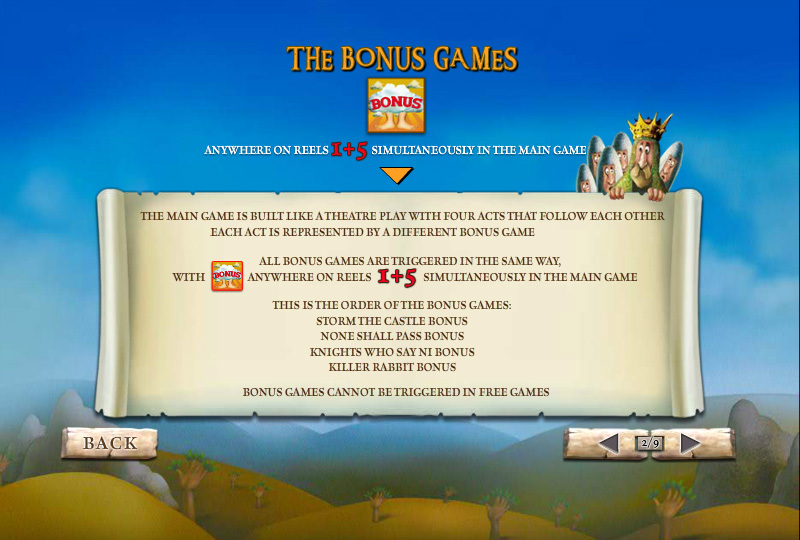 You will have to choose from items displayed on the screen to reveal bonus amounts. After three strikes are revealed, the bonus round will end and all winnings will be paid. If you are able to find three jackpot tokens during this bonus round, you will trigger an additional special feature called the Jackpot Round. Here you will spin a wheel with a chance to win the progressive jackpot amount. Play Captain Nemo today at a trusted Cryptologic online casino. 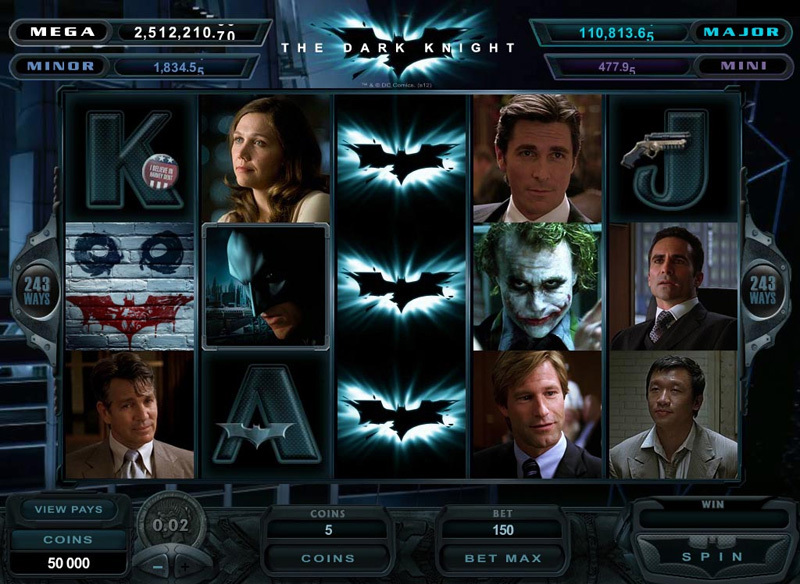 One of the recent online slots to be released by Microgaming is The Dark Knight, released on June 28th 2012. This new five reel slot features 243 ways to win, stacked wild symbols, free spins, a large progressive jackpot that starts at one million dollars, and several other random features. 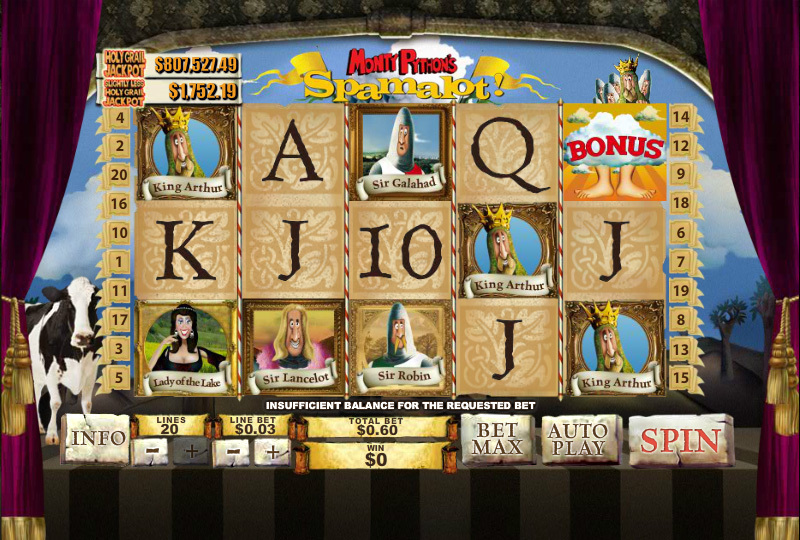 This new video slot has replaced the popular Lord of the Rings slot and it has been a huge hit since it was released. Read more about this rare move by Microgaming here. With every spin, regardless of the bet size, you will have the chance to become the next Mega Moolah progressive jackpot winner. 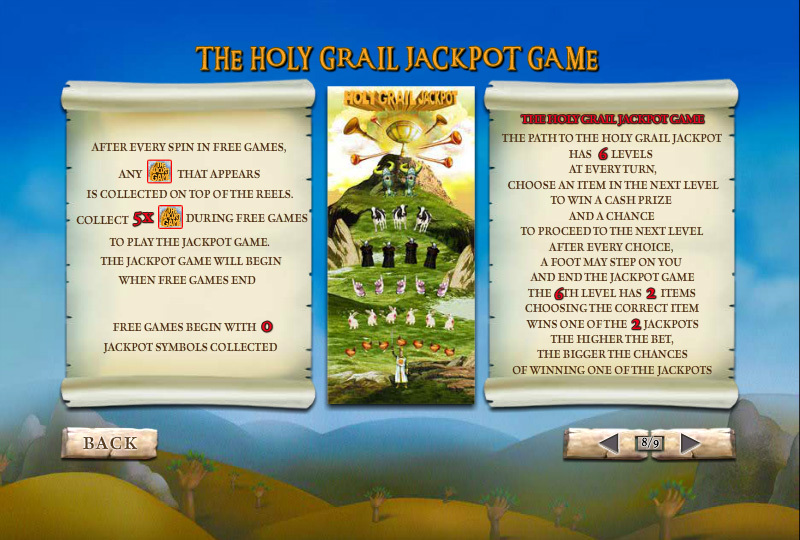 The Mega Moolah jackpot is a four-tier progressive which is connected to all Microgaming casinos. 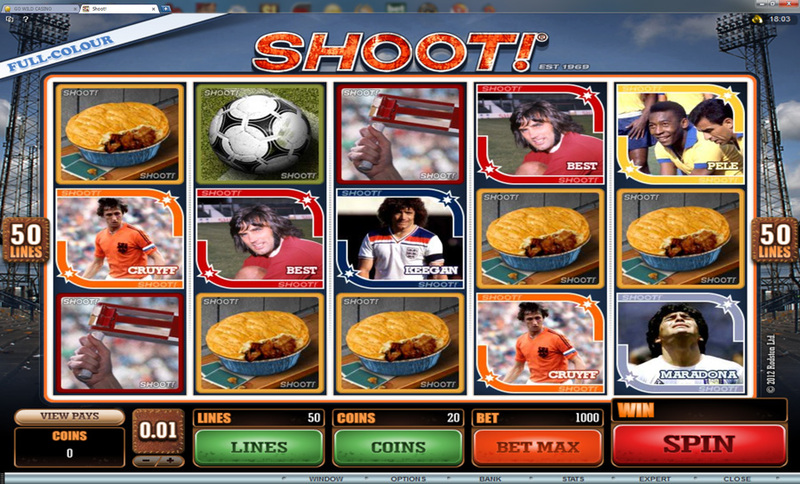 The jackpot feature is triggered randomly, and you are taken to a screen with a prize wheel. 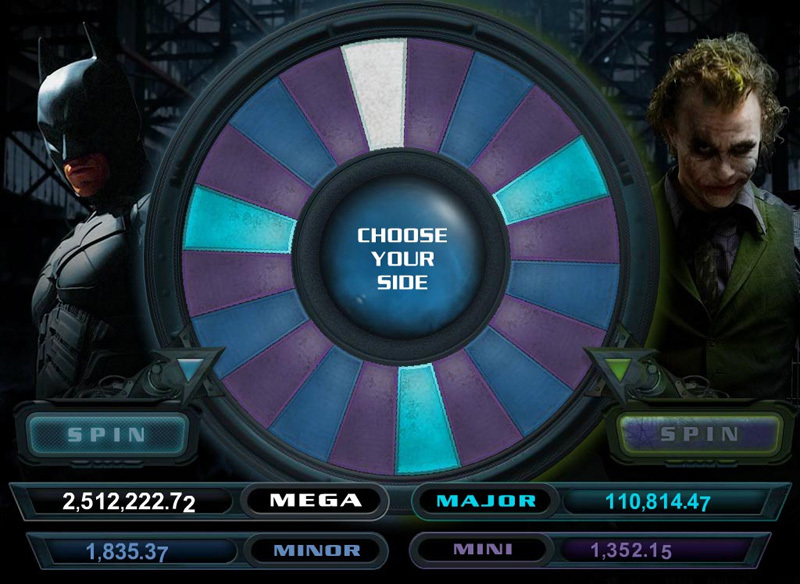 You then choose between Batman and the Joker to spin the wheel, and with a little luck you can become an instant millionaire. To help you stay in control, the game supports different betting options. This video slot can be played at either $0.01 or $0.02 coins with the betting range between $0.30 and $6 per spin. This is quite affordable for a progressive slot game. Batman or the Joker can randomly appear at any time to give you a prize. One of my favorite prizes is when Batman comes down and turns one or more reels wild at the end of a spin. 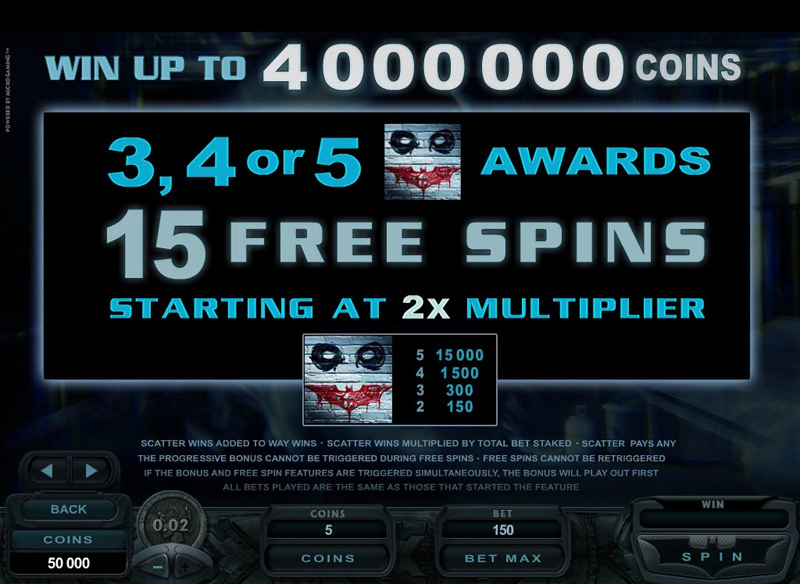 During free spins, the Joker can appear and give you extra free spins and higher multipliers. There are several other prizes they can give you that can turn a low or non-winning spin into a decent win, including cash prizes and win multipliers. The scatter in the game is the Joker graffiti symbol. If three or more of these symbols land on the reels, the free spins feature will be triggered. During this feature, you will earn 15 free spins that begin with a x2 multiplier. If you’re lucky enough to see the Joker a few times during the free spins, you can end up with a fairly high multiplier and several extra free spins. It would appear that The Dark Knight is exactly the same slot as the Lord of the Rings was, with different symbols obviously, but there is a little bit of a difference in the features. 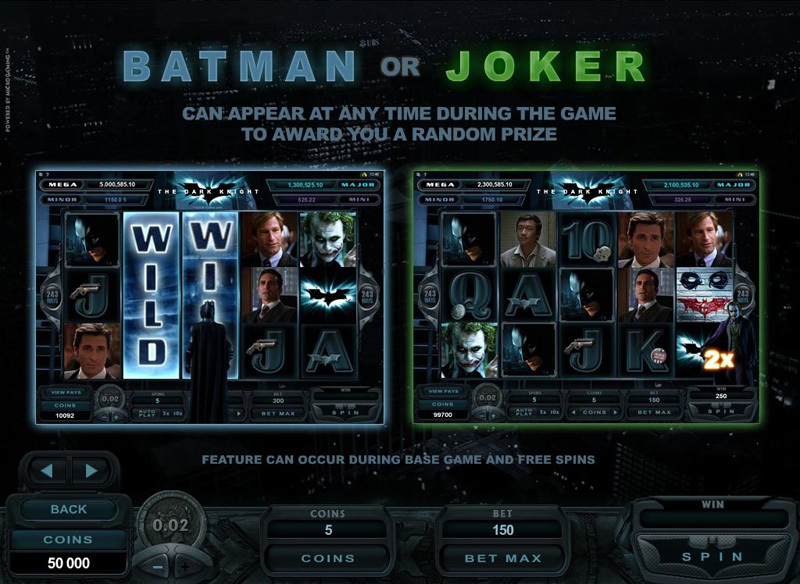 It seems that Batman and the Joker do a bit more than Gollum ever did, and I find that I can play this slot longer. I didn’t always enjoy playing the LOTR slot because I thought it was very cheap, and I couldn’t buy a decent win. I have enjoyed playing The Dark Knight a lot more. 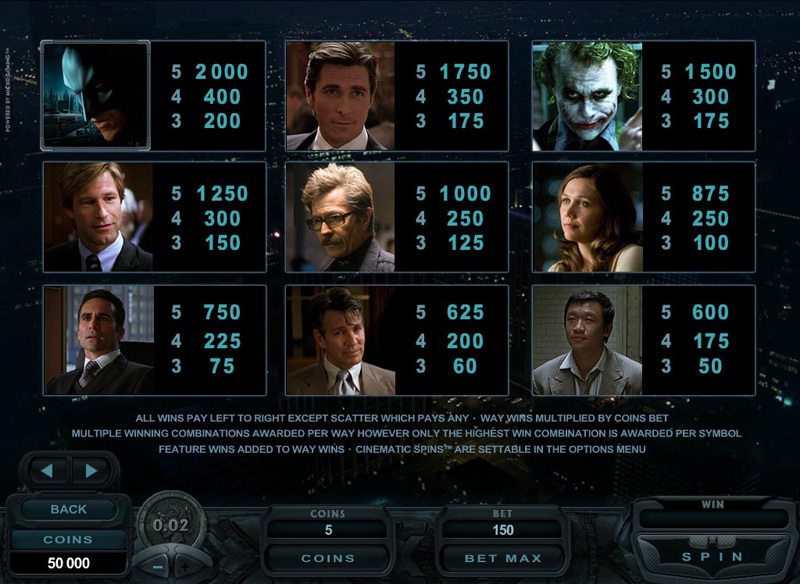 The Dark Knight is an affordable option if you are looking for a multi-jackpot game that is full of great features. Play it at any of these great Microgaming online casinos. 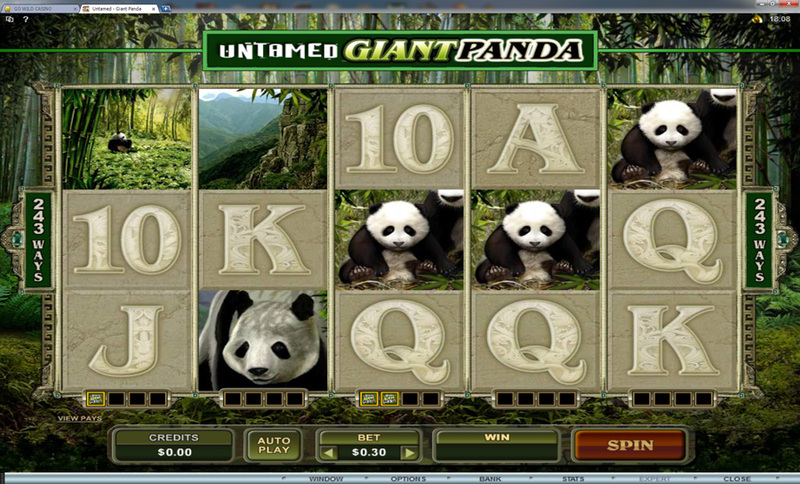 Untamed – Giant Panda is a new online slot game developed by Microgaming. This new five reel video slot features 243 ways to win, a free spins bonus with what they call ‘brilliant wilds’ which are basically sticky wilds, plus the collect-a-wild and lucky nudge features which were first introduced by the Untamed – Bengal Tiger slot. 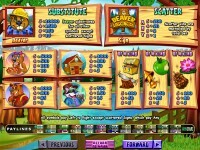 This slot supports coin sizes from $0.01 to $0.05 and as many as 15 coins can be played on each payline. Even though there are 243 ways to win on this game, it is considered to be a 30 payline slot, so the maximum bet for a single spin on this game is $22.50. The collect-a-wild feature is a great addition. 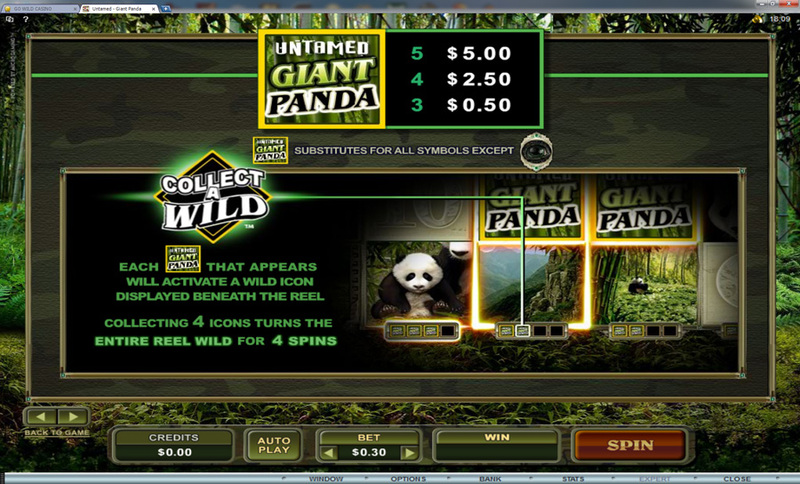 The wild is the Giant Panda symbol and when these appear on the reels, a token will be added to the counter beneath the reel. When the counter reaches four, the entire reel will become wild for the following four spins. It is possible to fill up more than one reel at a time, which can lead to some very nice wins. The scatter symbol in the game is the bejewelled eyes, which overlap the symbols a little bit above and below. 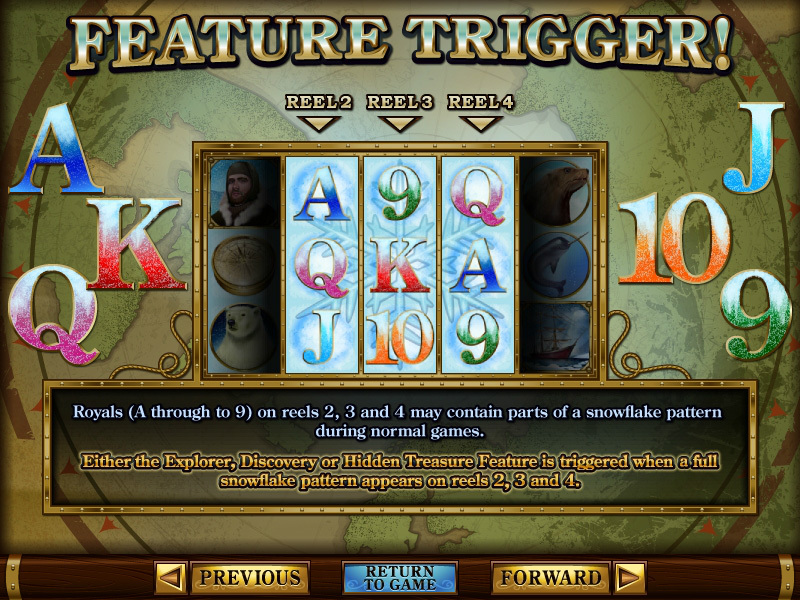 When three or more scatters land on the reels, it will trigger the free spins bonus. If two of these scatters land, and one of the scatters is just off screen (which you can see due to the overlap), the lucky nudge feature can nudge that symbol on to the screen and the free spins feature will be triggered. 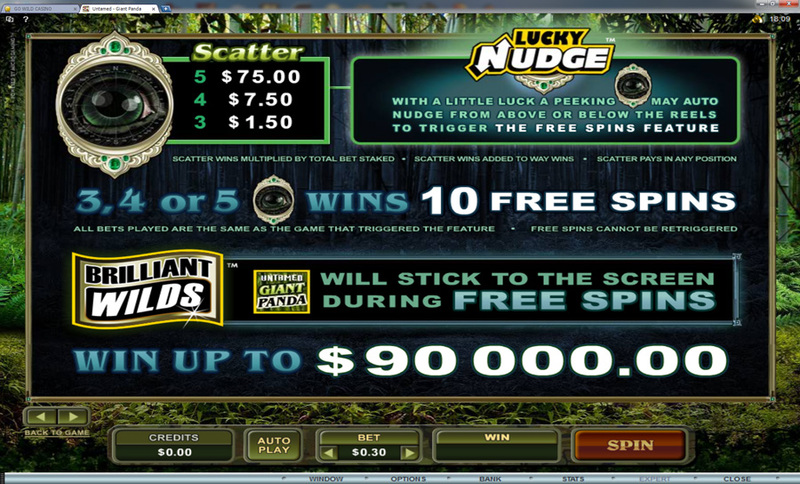 When the free spins feature is triggered, you will be awarded 10 free spins with sticky wilds. When a wild symbol lands on the reels during a free spin, the wild will stick in that spot for the remainder of the feature. Obviously some big wins are possible during this feature if enough wilds land on the reels. I have a love/hate relationship with these new Untamed slots. It seems to be tough to win anything without the features. Once enough wilds are collected to start turning some reels wild, you can hit some really nice wins, but you can also go without hitting much. Obviously there is luck involved with all slot machines, but with this slot it seems that you need luck and a feature to really get anywhere. I still play it once in a while because the potential for a big win is there, I just run away faster than other slots when I’m not doing well. Try it out for yourself at these Microgaming online casinos (not available to US residents). 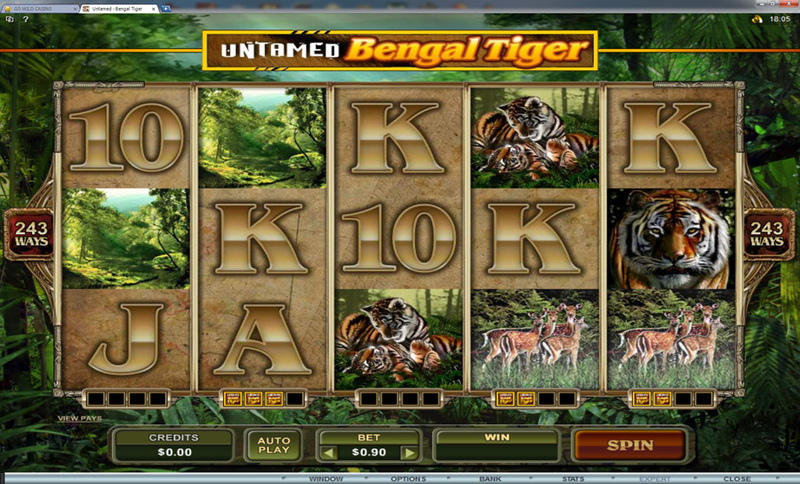 Untamed – Bengal Tiger is a new slot by the leading online casino software provider, Microgaming. This new slot features 243 ways to win, wild symbols with a twist, and a free spins feature with trailing wilds. 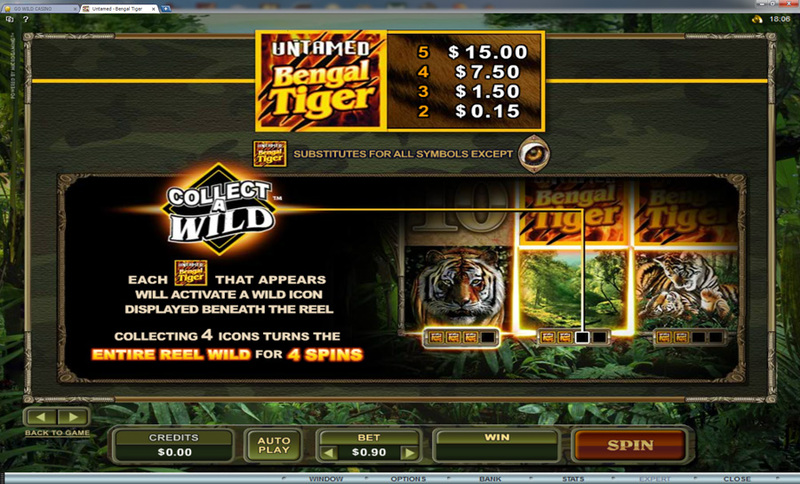 When the Untamed Bengal Tiger logo symbol appears, it will substitute for other symbols in the game, besides the scatter, and will help to create winning combinations. While this may sound like a standard wild symbol, it actually offers an additional feature. When the wild appears on any reel, there will be a counter added beneath the reel. When the count reaches four, players will enjoy an expanding wild on that reel for the next four spins. If you can get lucky enough to trigger the expanding wild on more than one reel at the same time, it’s possible to hit some really nice wins. The eye of the Bengal Tiger acts as the scatter symbol. When two of these appear anywhere on the reels, players will win double the amount of the wager. If players are lucky enough to get three or more, they will trigger a free spin round. To make things easier, there is a Lucky Nudge mini feature that can nudge a scatter symbol into position on the reels when the scatter lands just below or just above the play area. Whether it nudges or not is random, though it seems (from my experience anyway) that it will almost always nudge in from the top, but rarely from the bottom. Try it today with 10 free spins at Jackpot City Casino! No deposit required. 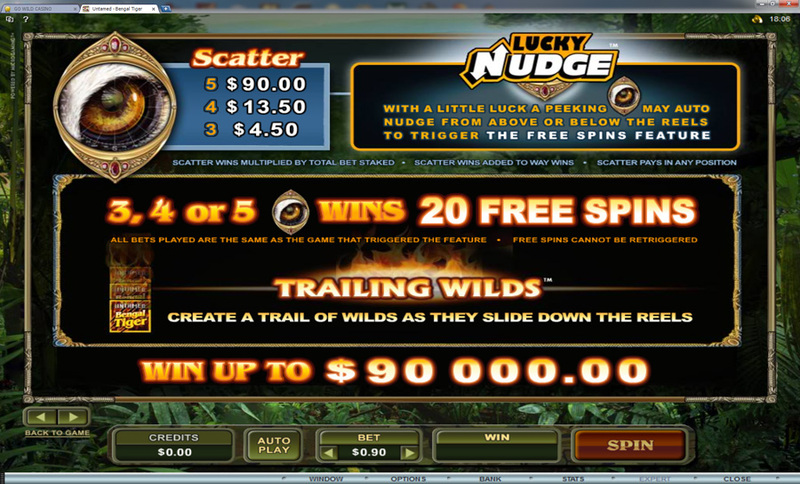 The free spin feature awards 20 free spins with “trailing wilds”. When a wild lands on the reels, it will stick there and then slide down for the next spin, adding an extra wild to that reel. Once it hits the bottom, all wilds on that reel will be removed for the next spin. If a wild lands on the bottom of the reel during a spin, obviously it has nowhere to slide, so it just goes away for the next spin. Big wins are possible if you’re lucky enough to get a few wilds sliding at the same time, and lining up five wilds several times is the obvious goal. While these mentioned features already add a lot to the game, there is even more. 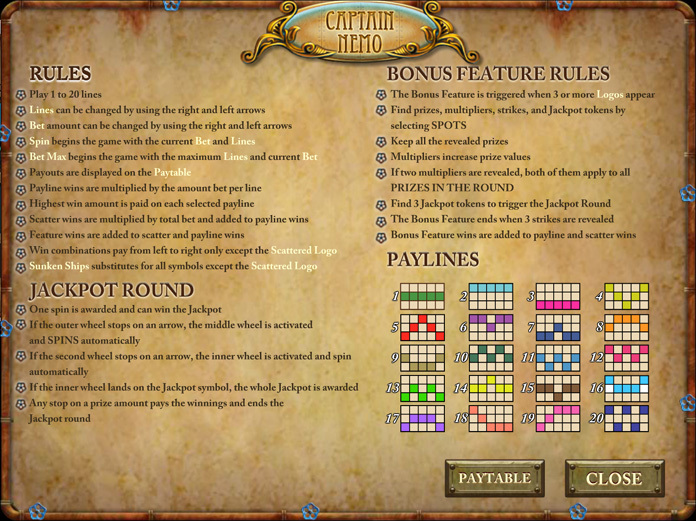 In addition to those features, the game also offers a gamble feature that allows players the great chance to multiply the amount of their win. This feature can be used multiple times until a player collects their winnings or loses the gamble. You can find Untamed – Bengal Tiger at any of these great Microgaming Casinos. Shoot! 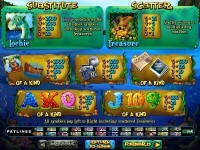 is one of the newest additions to the line up of great online slot machines developed by Microgaming. This new slot has 50 paylines, wild symbols, and a bonus feature that can give you cash rewards and/or 2nd level bonus features, including a free spins feature. The main attraction to this game is the Trade ‘Em Bonus round. This can be activated when players get three or more scatter symbols on the reels at any time. When this bonus round begins, players will see 12 cards displayed. They will have four choices to reveal the highest paying prizes. Mixed in with these 12 cards are two special cards that will provide access to second level bonuses, the Free Spins card and the Magazine Bonus symbol. If players are lucky and find the Free Spins card while selecting, they will immediately win free spins on the game. Players can earn anywhere from 10 to 35 free spins. All of the wins during this round will be doubled, offering a great opportunity to boost the bankroll significantly. If players can locate the Magazine Bonus symbol, they will then see 12 magazines appear on the screen. They will begin to select among the displayed magazines to reveal prize amounts. If a red flag is revealed, the bonus round will end and the normal game will resume. Play Shoot! at Go Wild Casino today! The game offers a standard wild symbol, which is the Shoot logo. This symbol can appear on any reel in any position. It can replace other symbols in the game but will not substitute for the scatter icon. When the wild symbol is used to create a winning combination, the symbol will not act as a multiplier. While it cannot multiply the amount of any win. It can help players complete some great winning combinations and receive big cash rewards. 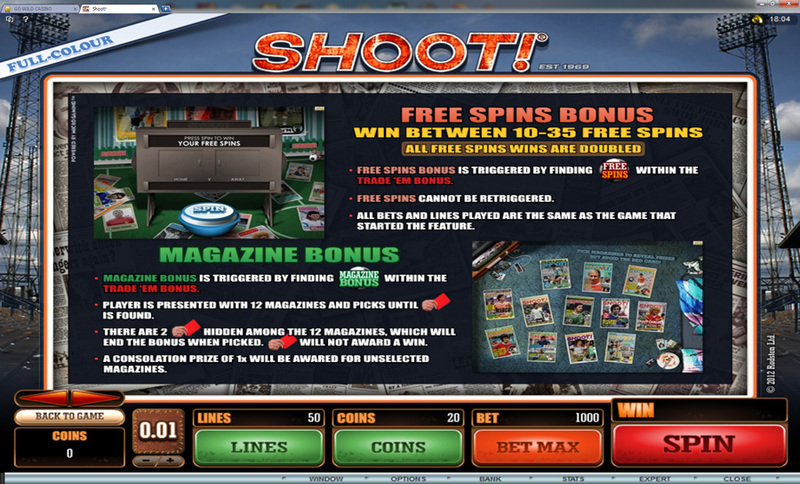 The game features 50 paylines which provide for many chances to create combinations. 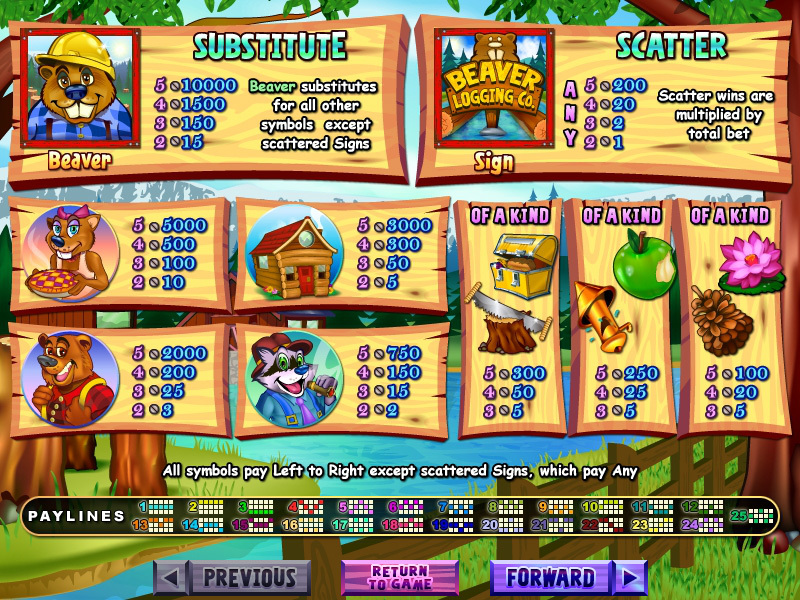 To accommodate players, there are various coin sizes that are supported, and the amount of lines can also be changed. This allows players to wager an amount that lets them stay within a set budget while still being able to enjoy the many features of this new and exciting Microgaming slot. You can find Shoot! and any of these Microgaming Online Casinos. 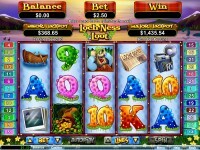 Loch Ness Loot is a new online slot developed by RTG. This new slot features 25 paylines, a wild symbol, and a free spins bonus feature. 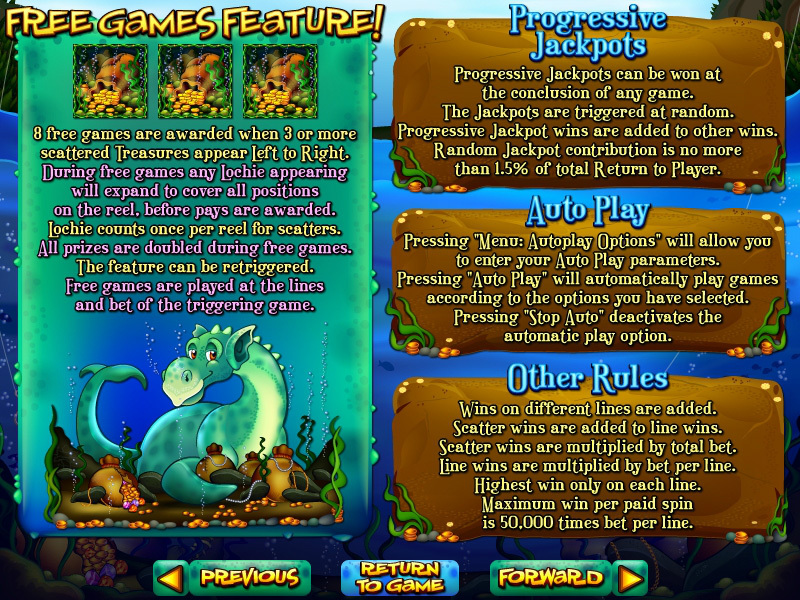 One of the main attractions to this game is the progressive jackpots. This game offers players the chance to win two different progressive amounts, the Major and the Minor jackpot. Both of these are randomly awarded, meaning no symbols have to line up during the winning spin. The jackpots will be awarded after the reels stop on any spin of any bet size. These random progressive jackpots are offered on all Real Series slots found at these RTG Casinos. While playing the game, players can create winning combinations using the wild symbol. This is the Loch Ness Monster and is will appear on any of the reels in the game. When it does appear, it will substitute for all symbols in the game. 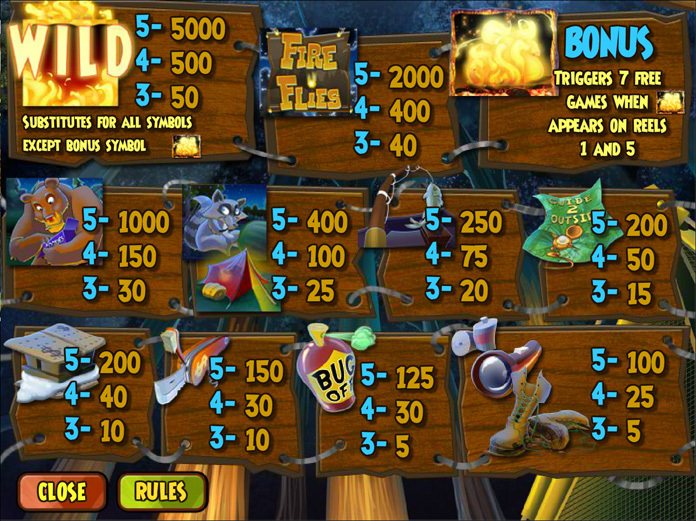 Many slots will not allow the wild to stand in for the scatter, but with Loch Ness Loot, the wild will take the place of every single symbol that is used in the game and can also trigger the free spins bonus feature. 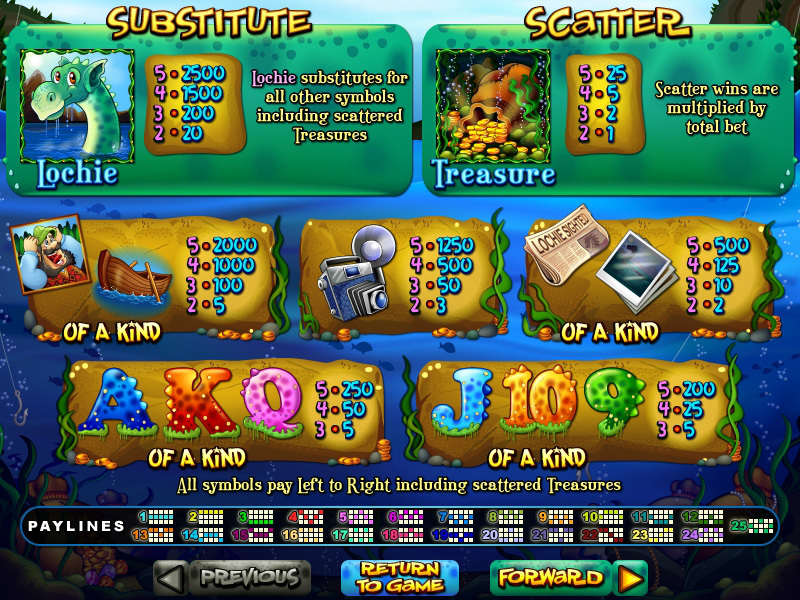 The Treasure symbol is the scatter and will trigger the Free Spins Feature. When players receive two or more of these symbols, they will receive a scatter payout. If three or more appear, the free spin round will be triggered. However, this is not the only way to activate the bonus round. Players can also receive a combination of wild symbols and treasure symbols to activate the free spin round. 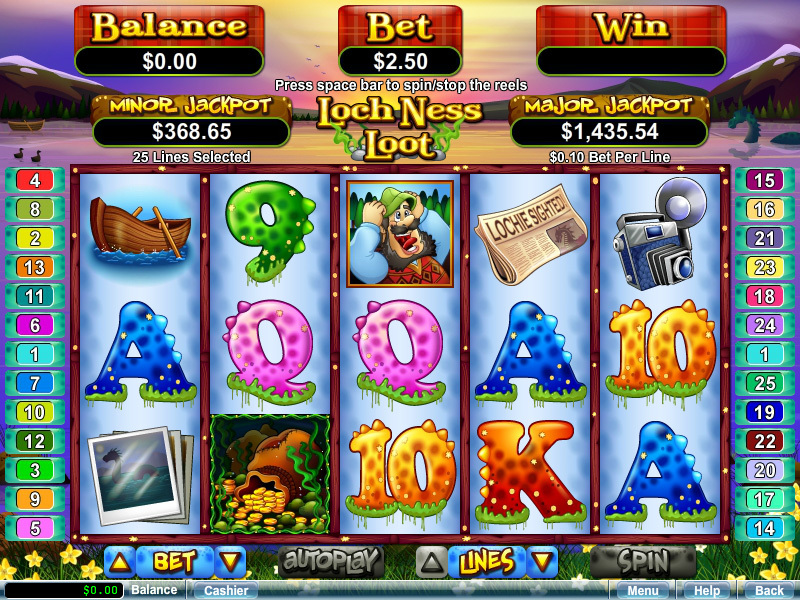 Play Loch Ness Loot at Slotastic Casino today! 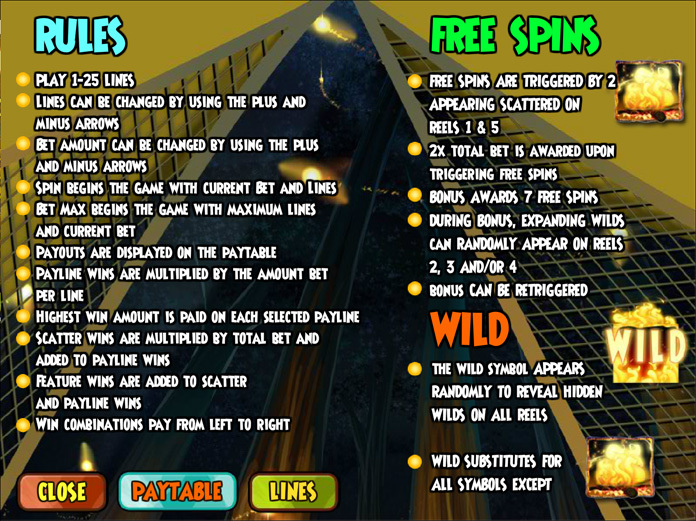 When the free spin round is activated, players will receive 8 free spins with expanding wilds. All of the payouts during this round will be doubled, offering players a great opportunity to boost the amount in their account. 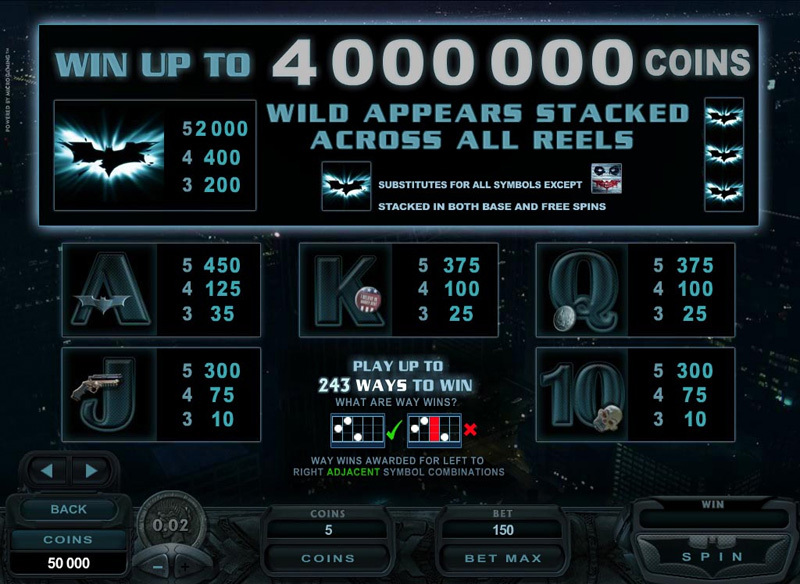 The wild symbol will expand on the reels during free spins, but only counts as one scatter per reel. This feature can be retriggered with combinations of wilds and scatters as mentioned. Loch Ness Loot has another great feature that is attractive to payers. This is the Win-Win feature. This is automatically triggered if players end the free spin round and their wins do not exceed 8 times the amount of their wager. If players receive absolutely no wins during the free spin round, they will automatically receive 150 times the amount of the bet with this feature. If 8 times the bet or less has been won, players will receive a payout of 5 times the bet. 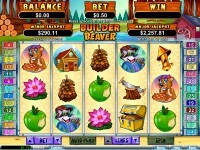 Builder Beaver is a new online video slot developed by RealTime Gaming (RTG). This slot offers 25 paylines, wild symbols, two progressive jackpots, and two different free spin features. The Beaver is the wild symbol and will substitute for all other symbols in the game besides the scatter symbol. This wild not only helps to create winning combinations, but is also a scatter symbol that will trigger one of the free spin features. If players are able to get three or more of these anywhere on the reels, they will trigger the Beaver Feature. The Beaver Feature gives you 12 free spins, with the wild symbol becoming a x3 multiplier that will triple any wins it is part of. 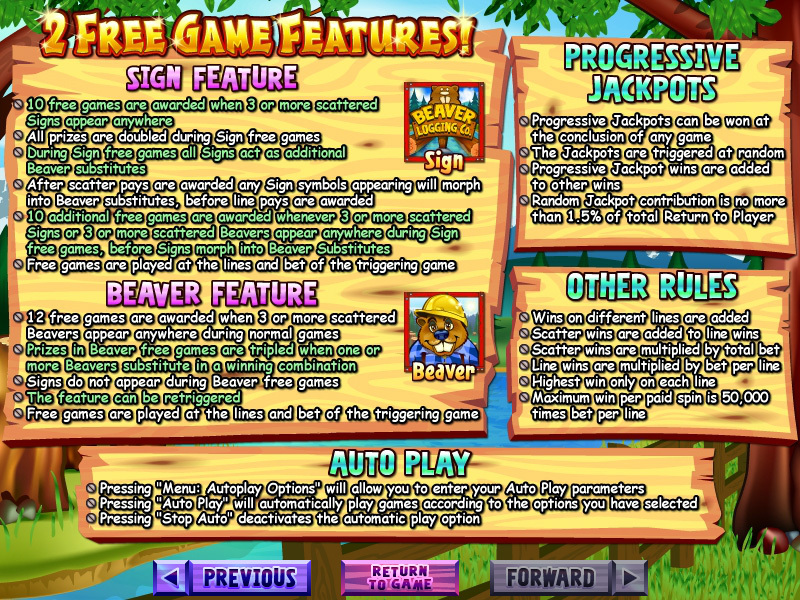 The other scatter symbol is not present during these free spins, but the feature can be retriggered if three or more Beaver symbols land during a free spin. The Beaver Logging Co. Sign is the other scatter symbol in the game. As long as players can get two symbols on the reels at the same time, they will receive a scatter pay. With three or more symbols, the Sign Feature will be activated. This round offers 10 free spins with all wins being doubled. During these free spins, any Sign symbols that land on the reels will change into wild Beaver symbols, after scatter wins are paid. This feature can be retriggered by either three Sign symbols or three Beaver symbols, before the signs become wild. Play it now at High Noon Casino! This game is part of the Real Series of slots from RTG, meaning that is offers progressive jackpots that are randomly triggered. 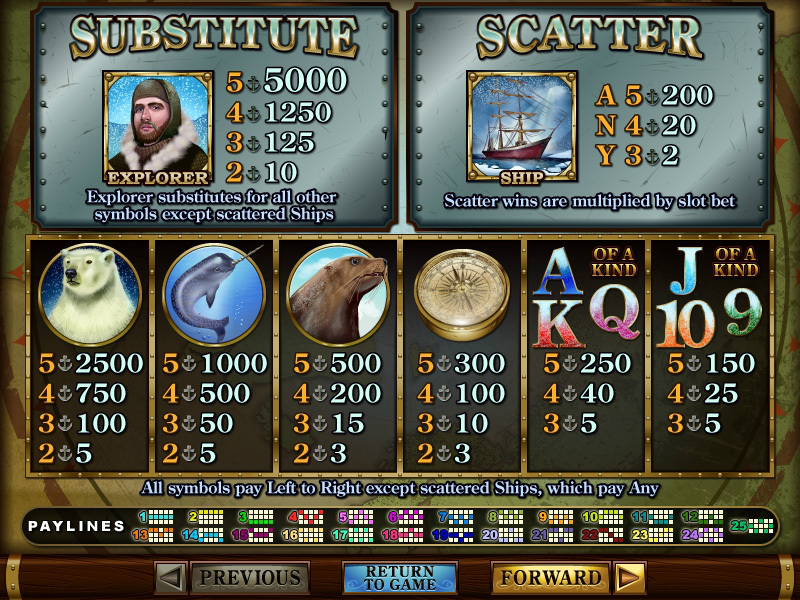 The Major and Minor jackpots can be won at any time after a spin has been completed. There is no specific combination of symbols needed to win either jackpot amount. Builder Beaver has a lot of potential. I prefer to play slots that have a free spin feature and this slot has two of them available. Players will enjoy the regular game payouts, the added scatter rewards and of course, the chance to win one of two progressive jackpots at any time. 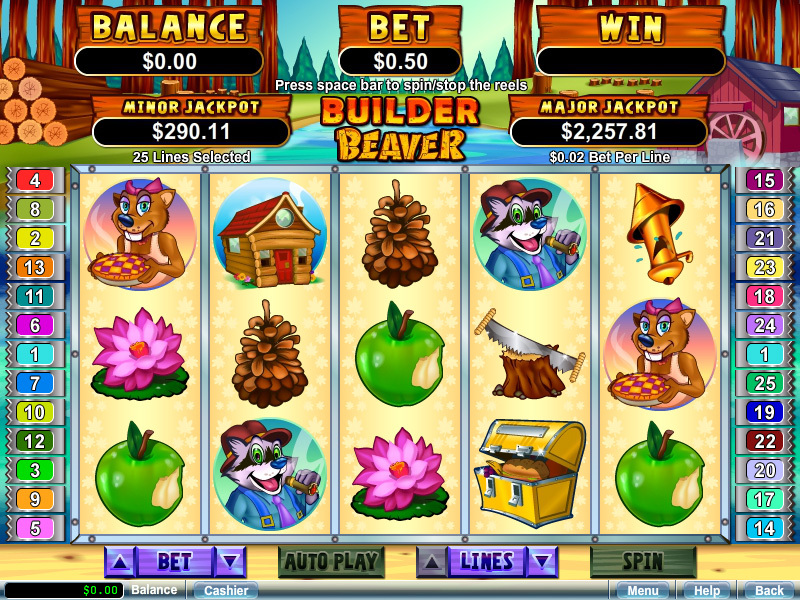 You can play Builder Beaver at any of these trusted RealTime Gaming Casinos.